During our first weeks home with baby, making dinner was the last thing on our minds. Family and friends played a huge role by bringing over food that we could either eat that night or toss in the freezer for a later date. 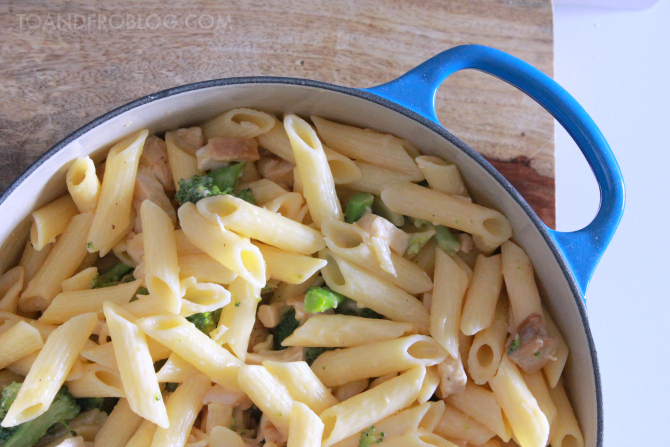 Pasta dishes were key because they were so easy to just pop in the oven and reheat. One of my favourite pasta dishes is mac & cheese. Anyone with me on that? However, it's also not exactly the best option when it comes to eating healthy. So, why not kick it up a notch by adding some veggies and protein? That's right, a healthier mac & cheese - the sneaky way to incorporate some fibre, protein and essential vitamins into your diet. Same old comfort food we all love, with a little side of nutrition. 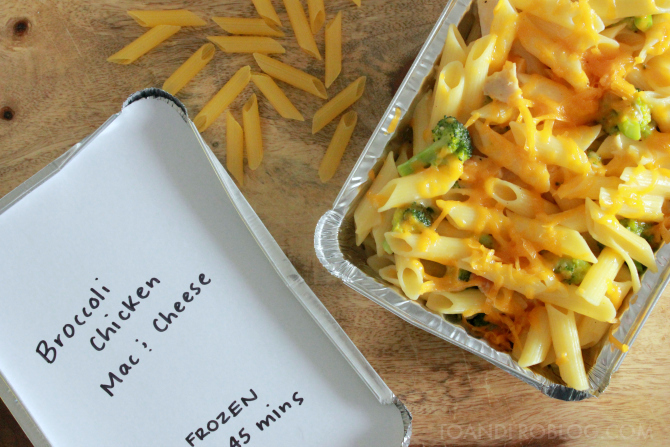 Whether you're bringing home baby, know someone who is, or are just on the go with limited time to make dinner, this easy, and freezer-friendly, broccoli chicken mac & cheese is the perfect recipe for you! Bring a large pot of salted water to a boil. Cook pasta al dente, according to package instructions. Remember not to overcook, as the pasta will soften slightly while baking. Approximately 2-3 minutes before pasta is al dente, add in the broccoli florets and allow to cook slightly. Drain pasta and broccoli and set aside. While pasta water is coming to a boil, melt better in a medium sauté pan over medium-high heat. Add garlic and sauté for 1 minute, stirring occasionally. Whisk flour into butter and garlic mixture until combined. Cook for an additional 1 minute, whisking occasionally. Slowly add stock and whisk until mixture is smooth. Slowly add milk and whisk until mixture is smooth. Continue cooking for 1-2 minutes or until mixture comes to a simmer. Remove from heat and stir in cheeses, salt and pepper. Pour the cheese sauce over top of the drained pasta and broccoli. Add chicken and toss until everything is evenly combined. Once combined, pour pasta mixture into a greased 9x13 inch baking dish and sprinkle with extra sharp cheddar cheese and breadcrumbs (optional). Bake uncovered for 15-20 minutes, or until the top becomes slightly crispy and the breadcrumbs are slightly golden. If preparing to freeze for later, omit steps 10 to 12. Instead, pour pasta into appropriate-sized aluminium takeout containers. Don't forget to include the reheating instructions on the container - thaw and bake uncovered at 350F for 15-20 minutes, or bake frozen at 350F for 30-45 minutes. Whoever the lucky recipient is, they will be grateful. 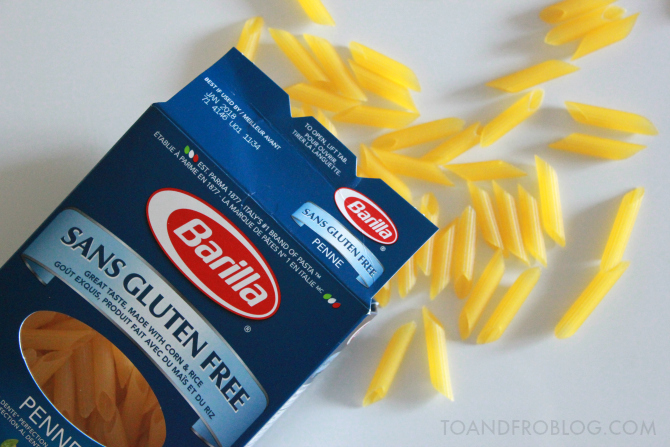 Made from corn and rice, Barilla Gluten Free Pasta has the same great taste and texture as regular pasta, and is suitable for those that are gluten free, egg free, vegan, vegetarian or just looking to eat healthier and be more conscious of what they are putting in their bodies. While we are not a gluten free family (the above recipe may contain ingredients with gluten), what drew me to this product was that it contains no GMO ingredients - something that is very important for my little family unit. 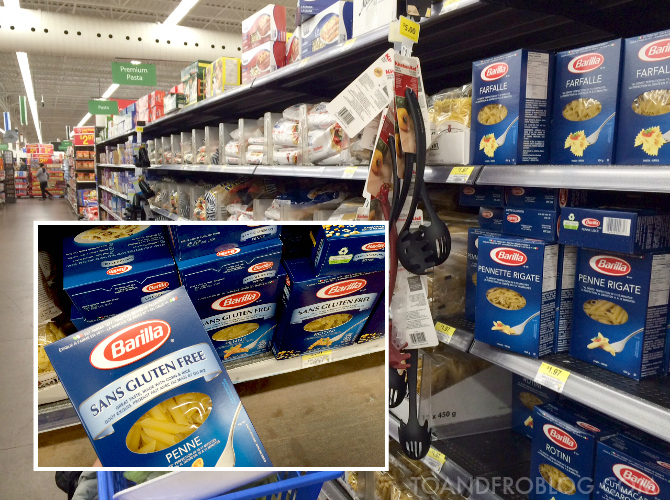 Barilla Pasta can be found in the pasta section at your local Walmart. Be sure to also look for their Whole Grain, ProteinPlus and Veggie varieties, and check out this Ibotta offer before you shop. 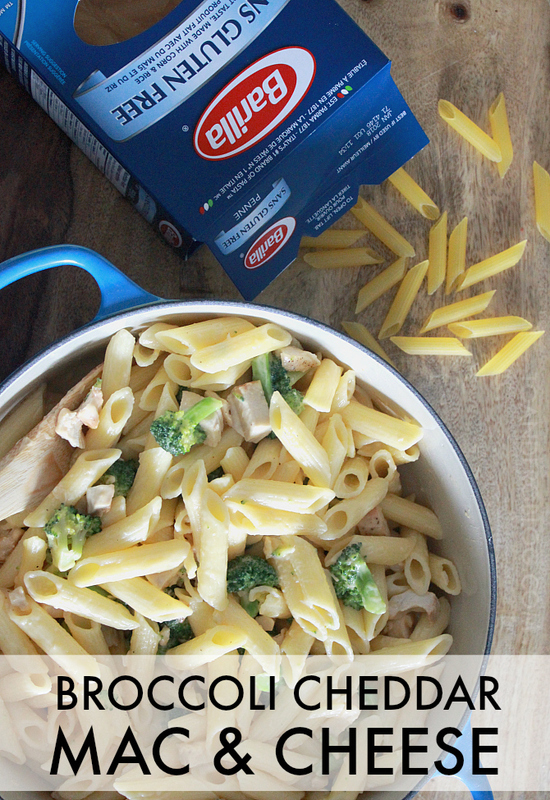 What’s your favourite type of Barilla pasta? How do you incorporate healthy into your favourite pasta dishes?